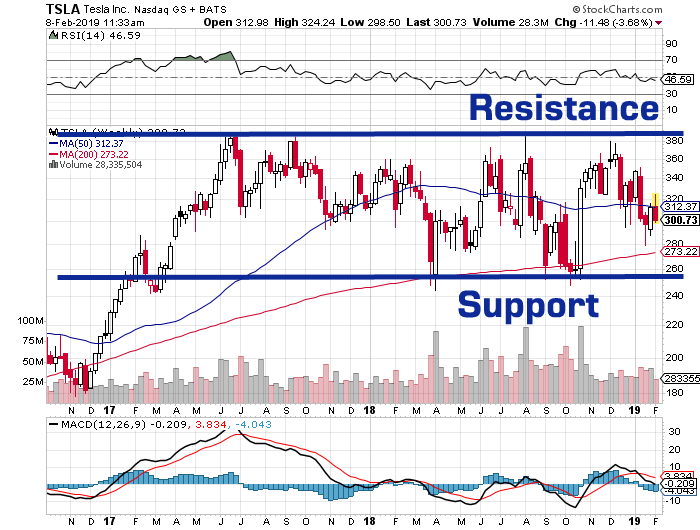 Support and resistance is an important concept in technical analysis, which is essential to understand in order to master reading price trends and pattern charts. Following will explain what is resistance in detail. Example: Assume that Bob has been holding shares in Microsoft for 2 months and notices that, during that time period, its price had failed to pass $25 several times. However, he also notices the price has gotten very close to moving above $25. In this example, the price level near $25 is a level of resistance. If the price were to rise above $25, there would be a break in the resistance. As you can probably assume from the example above, resistance refers to the price at which a stock trades, but not exceed past, for a period of time. The stock stops rising and does not break resistance because sellers start to outnumber buyers. In other words, this resistance price level occurs when selling is sufficient enough to disrupt or reverse an uptrend. It is represented on a chart by a horizontal line that connects several tops, signifying that sellers are overpowering buyers. 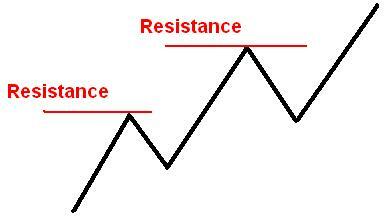 Resistance is also regarded as a ceiling because its price level prevents the prices from moving up and past it. When the price reaches the resistance level, supply is believed to be stronger than the demand, which means that it is preventing the price from rising above the resistance. However, resistance does not always hold and when it breaks, it signals that the bulls have beaten the bears in that fight, creating new highs. We will explain what is support in the next section. The support price level occurs when buying is sufficient enough to disrupt or reverse a downtrend. It is represented on a chart by a horizontal line that connects several bottoms, signifying that buyers are overpowering sellers. 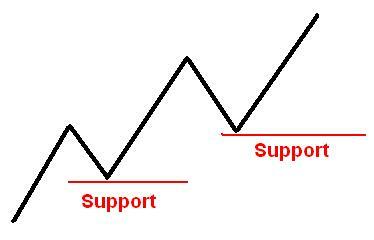 Support is also regarded as a floor because its price level prevents the prices from falling below it. When the price reaches the support level, demand is believed to be stronger than the supply, which means that it is preventing the price from falling below the support. However, support does not always hold and when it breaks, it signals that the bears have beaten the bulls in that fight, creating new lows. 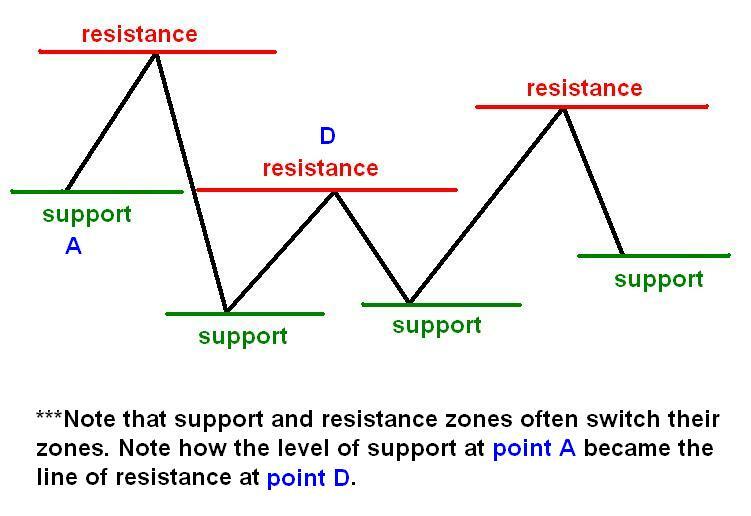 Let's look an example how to trade using support and resistance. Above is a weekly stock chart for TSLA that shows the stock has been trading in the range between $265 to $380 in the past 2 years. In this case, we will say the support is $250, and the resistance is $380. If we were to trade based solely on support and resistance, we would buy the stock whenever the stock approaches $250, and sell the stock when the stock approaches $380. We will do nothing when the stock is trading in the middle of that range. Of course, we will need stop loss in case the trade goes against us. Let's say if we bought the stock at $255, and it drops below $239. We would sell it because the support is broken, and the $250 price mark becomes the new resistance. But beware of false breakouts. For example, the market might break a price resistance and rally, but then quickly reverses and falls. Likewise, the market can also break support briefly just before it reverses and rallies. Professionals love false breakouts because it provides one of the best trading opportunities. Breakouts are similar to tails except that tails have a single wide bar, but false breakouts can have several bars, none of which are especially tall.